A historic Los Angeles landmark becomes a major West Coast theatre destination. The grand Art Deco theatre on Hollywood Boulevard is emblematic of the glory days of Hollywood’s Golden Age. Today, restored to its former splendor, the Pantages is part of a renaissance of the fabled avenue on which it stands. The Pantages opened as a vaudeville and movie place in 1930, the last of its kind to be built by impresario Alexander Pantages. It survived the Great Depression and subsequent economic downturns, weathered the changing fortunes of the motion picture industry, and witnessed the evolution of vaudeville into live entertainment. Even more remarkably, in the latter half of the last century, the Pantages endured urban decay and the decline of its neighborhood, not to mention the Los Angeles earthquake of 1994, only to emerge as the major presenting house for Broadway on the West Coast, and a catalyst for the revitalization of the blocks around the historic intersection of Hollywood Boulevard and Vine Street. 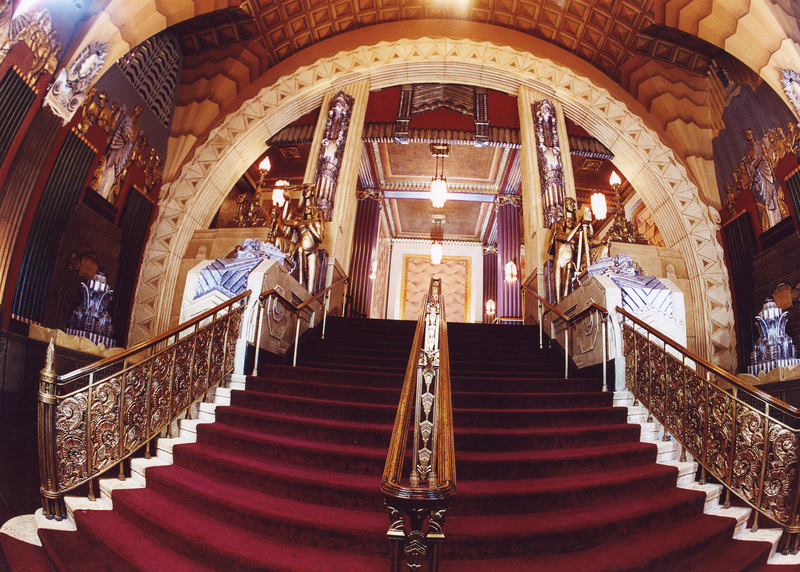 Step inside the Pantages and prepare to be dazzled. 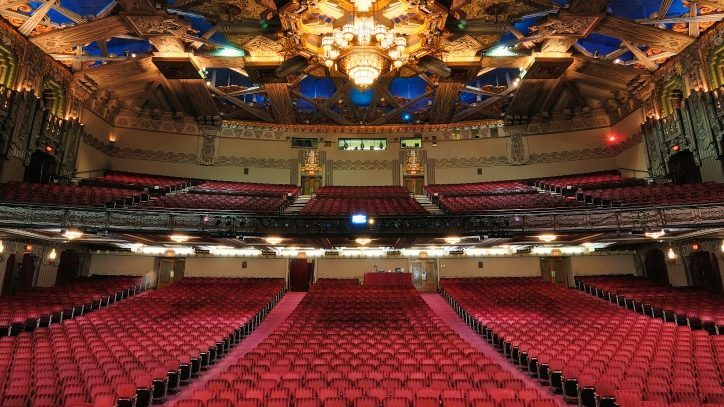 The opulent fantasy is the creation of B. Marcus Priteca, the architect who designed many such theatres for Alexander Pantages, and the Dutch muralist and interior designer Anthony B. Heinsbergen. (There are only two other Priteca-designed Pantages theatres that have survived to this day: one in Tacoma, Washington, and another in Minneapolis.) The interior, predominantly art deco — with geometric motifs, stark bold lines, and chevrons — also incorporates elements of the Egyptian Revival style and lavish gold and metallic leafing. 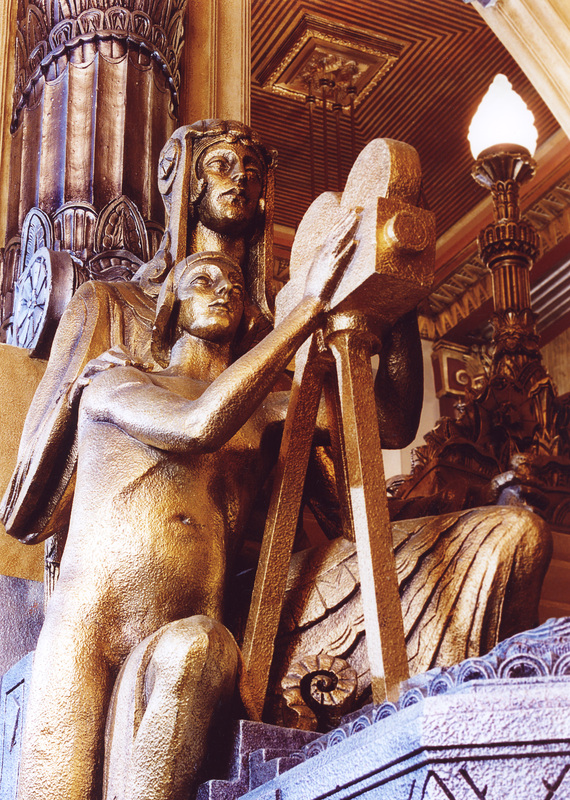 The two grand staircases at each end of the vaulted lobby are adorned by colossal statues that might feel at home in some ancient Babylonian palace or temple, except that they pay tribute to local California industry; one depicts a man with a movie camera. Inside the auditorium, which seats 2,700, a colossal chandelier of frosted glass and bronze hangs suspended from an ornate ceiling that conjures up the sun with its rays bursting outward. The historic theatre proved resilient since its inception. After opening the theatre in the year following the stock market crash, the Greek-American tycoon Pantages, by then embroiled in personal scandal and various legal battles, sold his flagship two years later to the Fox West Coast movie theatre chain. He subsequently died in 1936. The new owners went into bankruptcy after they bought the theater, but eventually in 1949, the theatre was purchased by Howard Hughes, through the RKO Pictures chain. (The legendary Hollywood mogul and aviator maintained an office and apartment in the adjoining office building, which currently houses the theatre management staff.) In the decade that followed, the theatre, now named RKO Pantages, became Hollywood’s crown jewel, hosting the annual Academy Awards from 1950 to 1959, including the first Oscar telecast in 1953. In the 1960s, even as the era of the big studios was coming to an end, the Pantages remained a prime venue for prestigious West Coast premieres such as Spartacus and Cleopatra. Purchased in 1967 by the Pacific Theaters movie chain, the Pantages continued to host road show (reserved seat) engagements of major studio releases. But, by then, the advent of television had permanently changed the movie exhibition business and grand movie palaces all across the country were threatened with extinction. Pantages general manager Martin Wiviott says that credit for the theatre’s survival into the 21st century goes to James M. Nederlander. “He’s the one who had the vision; he saw the future of Hollywood and he stuck with it.” Nederlander (known to all in the theater business as Jimmy) is chairman of the privately owned live entertainment organization that bears his family name. He first got involved with the Pantages in 1977 when his company partnered with Pacific Theaters to run the theatre. Under Nederlander’s management, the Pantages ceased to be a movie house and reopened as a legitimate theatre, starting with the West Coast premiere of the Broadway hit musical revue Bubbling Brown Sugar. In 1980, he purchased the theatre outright, by which time the surrounding area, much like its New York counterpart, Times Square, had lost all its glamour and respectability. “Hollywood had become downtrodden and seedy. There were just T-shirt shops all over,” says Wiviott. “When I first started here, there was only one little coffee shop to get a bite to eat within four blocks.” But Nederlander was thinking far ahead. He had his eye on the real estate adjacent to and across the street from the landmark theatre. “He would look out of the window in his office and say, ‘Who owns that little piece?’” Wiviott recalls. “It was like playing the board game Monopoly — a little piece here and a little piece there and then he put them all together. He used to say, ‘At some point, there’s gonna be something down here. I only hope I live to see it.’ Well he did live to see it,” says Wiviott. Nederlander will celebrate his 92nd birthday next month and the Pantages is in the midst of a huge development boom. “Now our patrons have their choice of 20 or 30 restaurants within walking distance for a meal before or after the show,” Wiviott adds. The most visited stretch of Hollywood Boulevard is a vibrant thoroughfare of less than a mile between the intersection with Highland to the west and the intersection with Vine to the east. The cornerstone at the Highland end is the Hollywood and Highland Center, a sprawling mall and entertainment complex that incorporates the historic TCL Chinese Theatre and the brand-new Dolby Theatre, current home of the Academy Awards. The Pantages, which is located just east of Vine, marks the opposite end. The neighborhood around the Pantages began to transform with the opening of the Hollywood and Vine subway stop in 1999, and the resulting influx of pedestrian traffic. The Los Angeles Metro Red Line station was actually built on land that Nederlander had presciently purchased some two decades previous. The new W Hotel, which opened in 2009 across the street from the Pantages, and the soon-to-be-completed apartment complex adjacent to the theatre also stand on land once owned by Nederlander. “He made sure that it got developed in a way that was appropriate for the theatre and he has been on top of the whole development of this corner,” remarks Wiviott. But without a doubt the star attraction on the block is the Pantages itself. In the late 1990s, when Disney was shopping around for a theatre to house the West Coast premiere of The Lion King, the Nederlander Organization sealed the deal by committing to restore the Pantages to its 1930s grandeur and to make the necessary renovations to accommodate the epic musical theater production. Prior to the theatre’s reopening in the fall of 2000, craftsmen had toiled painstakingly for nearly a year on the restoration — removing a fake ceiling in the outer lobby to reveal the original decorations, replacing the missing chandeliers with exact replicas, repairing the gold and metallic leaf on the lobby walls, and repainting the decorative murals. For The Lion King specifically, a 40-foot-deep pit was dug under the stage to accommodate the stage machinery for the Pride Rock, the musical’s dramatic set piece, and the aisles were widened to allow for the rousing elephant parade at the start of the show. The face-lift eventually cost more than $10 million, but it gave the Pantages a new lease on life for the millennium and equipped the theatre with new resources to meet the technical challenges of the Broadway blockbusters that followed, not to mention the return engagements of the perennial Disney megahit itself.